The information in the following Boston University club sport highlights was taken from the BU Club Sports Event Calendar from Dec. 3 to Dec. 10. The BU men’s club ice hockey team faced off against crosstown rival Boston College on Dec. 3 in Brookline. Despite starting off slow in the game, the Terriers responded with strong performances in the second and third periods to come away with the win. Junior captain Matt Fineberg led BU with two goals and an assist, while four other players came away with multi-point showings, including junior forward Lucas Esposito (one goal, three assists). With the win, the Terriers improve to 5-2 in the Northeast Collegiate Hockey Association (NECHA). The BU men’s club ice hockey team continued its strong play against NECHA opponents Saturday when it took on Merrimack College in North Andover. Several players posted impressive stat lines against the Warriors, including junior forward Mike Gates (two goals, one assist), junior forward Dillon Schuyler (one goal, one assist) and sophomore forward Riley Marotta (one goal, one assist). Junior goaltender Jared Hynes was stout in net for the Terriers, giving up just one goal in the contest. The BU club inline hockey team kicked off a busy weekend slate of games with a match against Niagara University Saturday at 7 a.m. The Terriers dominated in the first period, notching four goals off 19 shots, with eight players contributing a point into the offensive outburst. BU would not ease its offensive pressure, chipping in an additional six goals to come away with the 10-2 win. The Terriers were paced on offense by senior defenseman Kevin Robitaille (two goals, four assists) and junior forward Nick Breed (one goal, three assists). 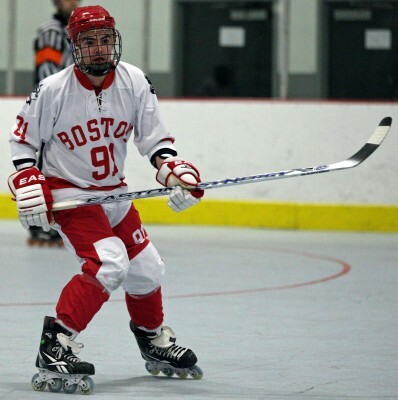 The BU club inline hockey team continued its stretch of Saturday games with a contest against Drexel University. At first intermission, both teams were locked in a 1-1 draw, with both goals coming just 20 seconds apart in the first period. At the conclusion of the second stanza, Drexel jumped out to a 3-2 lead, but the Terriers would answer back, scoring three unanswered goals in the third period to come away with the win. The Terriers received a big boost from Robitaille and forward Jake Strzalkowski, as both skaters recorded two goals and an assist. Senior goaltender Mark Flitsch got the call in net and made 27 saves in the victory. The BU club inline hockey team finished its trio of Saturday games with an impressive win over the State University of New York at Oswego. The Terriers jumped out to a 1-0 lead at the end of the first period due to a goal from senior defenseman Jordan Reinhardt, but Oswego would quickly tie the game early in the second period. BU would answer back, scoring five unanswered goals in the frame — three of which were on the power play. The Terriers and Lakers each added a goal in the third period to end the game with a 7-2 advantage in favor of BU. Reinhardt led the team in scoring with three goals and two assists, while both Robitaille (one goal, three assists) and Strzalkowski (two goals, two assists) finished with four points. The BU club gymnastics team hosted its third annual Rhett’s Bowl Saturday afternoon at its gym in Woburn. Syracuse University, the University of Vermont, Sacred Heart University, Massachusetts Institute of Technology, University of Pennsylvania, Temple University, Yale University and Cambridge Community Gymnastics all participated in the event, which was dedicated to the memory of BU gymnastics coach John Redmon, who passed away in 2013. The BU women’s team placed fifth in the event with a score of 116.5, while the men’s team ranked third with a team score of 235.5. Jonathan Lerch impressed for the Terriers, finishing second on the floor with a score of 12.8, third on pommel horse at 12.4 and second on parallel bars with a mark of 12.8. The BU club inline hockey team closed out its fall semester with a strong showing against Pennsylvania State University Sunday afternoon. The first period was a high scoring affair, with the Terriers holding onto a 3-2 lead at first intermission. BU put the game away in the second, registering four goals on 16 shots to make it a 7-2 game. The Terriers added one more tally in the third period to come away with the 8-2 win. Breed and Reinhardt each contributed two goals and two assists, while Flitsch notched 19 saves.